The GYROTONIC® and GYROKINESIS® method incorporates select movement principles which draws upon a variety of modalities including yoga, dance, gymnastics, swimming, and tai chi. It allows your joints to fully elongate and expand while placing your body in a supportive environment to provide endless possibilities of movement. It is a system that focuses on opening your body internally and externally. It is unique in that the spine can be mobilized in all planes of motion, and it approaches the body holistically. The circular and undulating movements of the spine and skeletal system enhances spinal flexibility and core strength, decompresses and mobilize the joints, and stretch and strengthen muscles, ligaments, and connective tissue. 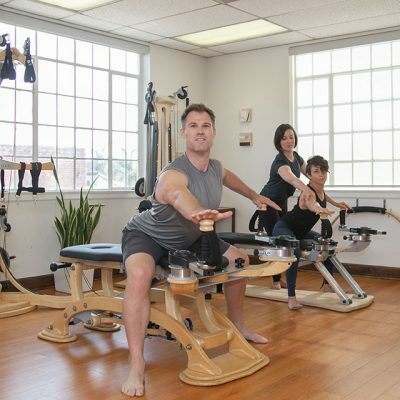 The GYROTONIC® method incorporates various equipment including the GYROTONIC® Pulley Tower Combination Unit, JUMPING STRETCHING BOARD, LEG EXTENSION UNIT, THE ARCHWAY, and GYROTONER®. The most commonly used equipment, the GYROTONIC® Pulley Tower, consists of a wooden tower with weighted pulleys and a padded bench with two rotating handles. The rotating handles allow you to perform a series of arches and curls which smoothly guide your spine through a myriad of spinal motions (flexion, extension, spiral, and lateral flexion). The Pulley tower provides resistance and supports the movements of your upper and lower body utilizing the pulley’s straps. The overall movement is smooth and fluid, which improves strength and stability while being kind to your joints. GYROTONIC®, GYROTONIC LOGO®, GYROTONIC Expansion System®, GYROKINESIS® and GYROTONER® are registered trademarks of the Gyrotonic Sales Corp. and are used with their permission.